The Annual Report 2017-18 was tabled in Parliament on 15 October 2018 and forms part of the Commission's annual report series. The Annual Report 2016-17 was tabled in Parliament on 23 October 2017 and forms part of the Commission's annual report series. The Annual Report 2015-16 was tabled in Parliament on 13 October 2016 and forms part of the Commission's annual report series. The Annual Report 2014-15 was tabled in Parliament on 23 October 2015 and forms part of the Commission's annual report series. The Annual Report 2013-14 was tabled in Parliament on 21 October 2014 and forms part of the Commission's annual report series. The Commission's Annual Report 2012-13 focuses on using administrative data to achieve better policy outcomes. The Commission's Annual Report 2011-12 focuses on structural adjustment in a 'multi-speed' economy. The Commission's Annual Report 2010-11 focuses on managing demographic change. The Commission's Annual Report 2009-10 focuses on the importance of evidence and process in establishing good public policy. The Commission's Annual Report 2008-09 focuses on the importance of maintaining open and liberal trade policies in light of the global financial crisis and associated economic downturn. 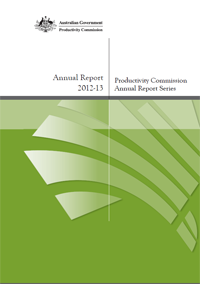 The Commission's Annual Report 2007-08 focuses on enhancing Australia's productivity growth. The Annual Report 2006-07 focuses on enhancing labour force participation. The Productivity Commission's annual report focuses on Australia's national reform agenda. The Productivity Commission's annual report focuses on the Australia's federal system of government operates. The Productivity Commission's annual report focuses on the ageing of Australia's population. The Productivity Commission's annual report examines Australia's productivity performance. The Productivity Commission's annual report examines the issues associated with the fact that governments have been extending the reach of markets into areas of the economy where governments themselves once made all the resource allocation decisions. The Commission's annual report discusses the important role that pro-competitive regulation of infrastructure plays in enhancing economic welfare and curtailing abuses of market power and reducing the risks of regulatory failure. This annual report includes an analysis of Australia in the global economy and a summary of the Commission activities. The surge in productivity appears to be a break from past trends, allowing Australia to pursue sustainably higher economic growth and living standards with fewer fears of inflationary pressures.